Power your 2.1mm barrel-powered device via AC power with this PSA12421 AC Power Kit from Bescor. The kit consists of a 12 VAC, 5A power adapter with a 4-pin female plug, an XLR male to 2.1mm barrel power cable, and a power cord to plug in the AC adapter. Power your lights with this 4-Pin XLR Male to 2.1mm DC Barrel Power Cable from Bescor. 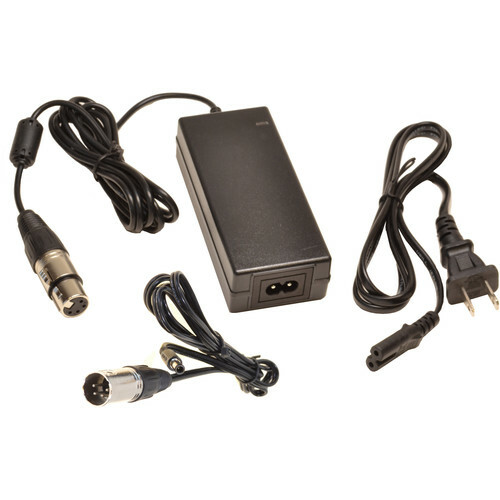 This 10'-long cable features a 4-pin male XLR connector on one end and a 2.1mm DC barrel connector on the other end to supply power to your gear with a compatible battery or power adapter.